"Now I can cross the shifting sands." When people encounter the phrase "there is no scientific evidence to support that claim", sometimes they erroneously equate this to mean that either the claim is false or the claim is meaningless, both of which would be illogical assumptions. It means just what it says it means, no more, no less. For some, their world view is that only scientific knowledge is knowledge. But Knowledge does not require science to exist. The Scientific Method is a wonderful tool, capable of finding physical relationships with unequaled clarity and precision. But that is all it is, a tool. Anything more remains within the domain of our Reason and our Philosophies. The concept of an "armchair scientist" or "armchair philosopher" has been a point of ridicule over the last 150 years, drawing on stereotypes of pipe-smoking men sitting in an armchair, musing, and then spouting off intellectual nonsense with a high degree of confidence. However, if you ignore the stereotype, the actual concept of a person discovering new knowledge through pure thought experiment while sitting in a chair is fascinating. This is similar to the concept of meta analysis↗. One of the problems with using pure thought experiments is that you are confined to your own thought processes (which can make errors), and your own memory (which is a limited set of information mostly provided by other people, stored in a way that is meaningful to you, which can also contain errors). You have to have studied and accurately memorized relevant information about the external world, and you have to be a very disciplined thinker. You also have to have memorized the actual information that could validate or invalidate your conclusions. This is very difficult to do while seated in an armchair, almost impossible. It takes time to theorize and make predictions, so how would you know what information to memorize to test these predictions before you sat down in that chair? So it would seem that armchair thinkers are limited in the knowledge they can produce, but it is likely that there is some information in their memory that is accurate and relevant, out of the voluminous information stored in the human brain, and if they are a critical thinker, it is therefore possible to generate some levels of new knowledge. But if we consider that our subconscious drives most of our decisions, it may have pro-actively (a word that originated with 1930's-1940's psychology) directed us to capture the data needed to successfully carry out a conscious thought experiment and arrive at a conclusion. The subconscious may even pre-decide the areas of interest to the conscious mind, predisposing it to perform only the experiments that are within its capabilities. Proactive, predeciding, predisposing. The brain is a predictive machine↗. This would be analogous to a team of programmers pre-loading a computer with information relevant to its processing goals, and then running a program to perform the calculations and return the results. The computer will generate new knowledge. It does not have to be a networked computer in real-time communication with the outside world. This is known as computation, translating information from one form into another. Let's sit down in that chair. Take a seat. It sure feels like we are generating new knowledge. In fact, if we aren't generating new knowledge when we are thinking, then what are we actually doing? We retrieve memories and come to new conclusions about them, or the memory reminds us about something we have forgotten (which is a "new" conclusion). Most of the knowledge in our world is not scientific, but it is no less real and no less valuable than scientific knowledge, perhaps even more real. For example, if you were sitting in that armchair, and a coin fell out of your pocket into the chair, even if you saw it fall, under the conventions of modern science, there is "no scientific evidence to support your claim". But it happened--you remember seeing it. And if you didn't retrieve your coin, you might not have had enough money to put in a parking meter to avoid getting a ticket. It has real-world consequences for your life. Why is there no scientific evidence? You saw the coin fall. Many scientists do not consider human perception, memory recollection, or reported experiences to be "evidence", let alone a sample size of 1. They only consider "empirical evidence", something that a collective of people (peers) can measure with scientific instruments, to rule out error, to obtain the same results (replication). However, there is scientific evidence to support the claim that things do fall (gravitation), just not any evidence that your coin, your specific instance occurred. But don't worry, the field of Law uses a different definition of evidence, applying human reason. It doesn't let our empirical mind run rampant over our rational one. The trail of events of our lives, our worldline or path through the Cosmos, is very real to us as individuals, but don't expect others to agree with you. They won't have the evidence, they just have their own individual world lines. But we can communicate our experiences with each other, providing knowledge to each other that may help each other to navigate their own world lines, to achieve our goals. But, like that armchair thinker, we must perform our "computation" on their knowledge to transform it into something that we can specifically apply to our own life. Everything is filtered through the armchair, our own intellect. Let's assume that we cannot be in communication with the outside world (telephone or tablet computer) and return to the decades that preceded radio communication in the 19th century. If we find ourselves in a state of technology withdrawal, perhaps we can reminisce by opening up a window and listening to the shrill of a red-winged blackbird. Have you ever noticed how the calls of some birds, frogs, and insects sound eerily similar to early data communication technologies (early audio frequency-shift keying protocols), the modem sounds people used to hear during the dial-up days of the early Internet? These animal calls are indeed data transmissions in a language that we have not yet decoded. Let's also assume that we are free of mind-altering substances (no caffeine, no alcohol, etc). Perhaps you have a cup of berry tea next to you. 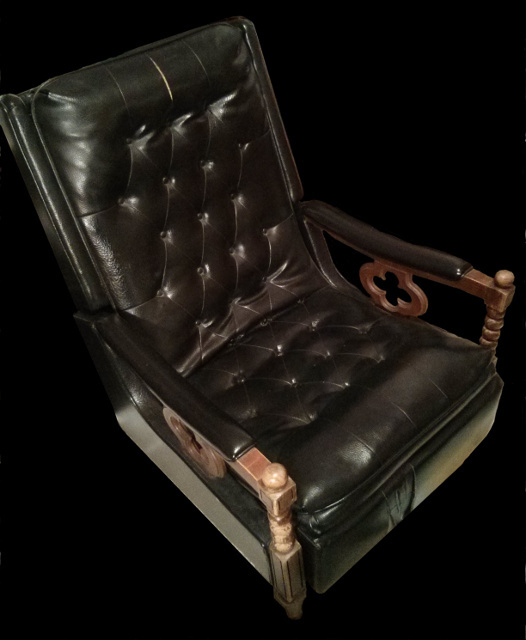 Besides our memories gathered by our subconscious, besides our ability to compute and reason, is there anything else (besides loose change) in this armchair that we can use? If the Universe is fractal at all scales, and thus self-similar, then observed, external patterns will repeat. Being physical beings, our body and brain will contain similar patterns, our thought processes will contain similar patterns, our language and our memories will contain similar patterns. In other words, we have a more accurate dataset than we realize. The information that we can derive from this dataset is astronomical, and would overwhelm every library on earth. The dataset is a compressed form of information, and we can use tools to decompress and understand it. Logical deduction, for example, is one of our best tools. Our memories contain massive warehouses of logical polysyllogisms↗, and the number of new conclusions that could be derived from their combinations is vast. Is this a "sufficient" quantity of knowledge? Or do we need more? Most of us are already overwhelmed by the amount of knowledge Mankind has created. As an individual, each of us cannot absorb and understand the vast majority of human knowledge. It was created from a collective organism, of which we are just one part. And the individuals that ridicule armchair scientists and philosophers for their lack of field work and data collection are simply a component of the same collective organism, similarly performing science in an "earthbound" armchair. Almost all of our sensors and data collection are earthbound or in earth orbit. There has never been a human being or astronaut to leave earth orbit, since even though two dozen Apollo astronauts entered lunar orbit, many exceeding earth's escape velocity of approximately 25,000 mph, they never actually ventured beyond its natural satellite. In 2013, Voyager 1, an unmanned spacecraft launched in 1977 finally reached interstellar space, the only spacecraft so far to do so. And yet, 99.9% of the knowledge of Mankind was developed while remaining within our earthbound armchair. What does that tell us about scientific knowledge? We believe that science has developed an understanding of the Universe, and yet we're all sitting here on earth. If we believe that science has obtained a sufficient understanding of the Universe, then logically, we must also concede that being confined to an armchair does not pose a restriction to a sufficient understanding as well. Even if we do colonize other planets, it will be difficult to leave the solar system. Even if we do leave the solar system, it will be difficult to leave the galaxy. Is the "scale" of our spatial travels significant? By the time Mankind has managed to get there, it will have also deduced more conclusions from its vast number of syllogisms. In my opinion, knowledge is scale invariant↗. It does not have differing properties depending on how much we learn. What is the point of knowledge? Is it to solve problems, empower ourselves? Once we solve the problems we find more. Once we empower ourselves, we find we are still powerless. It is an addiction. It is the drug that we bring with us into our armchairs. In the 2014 film Lucy by Luc Besson, a woman played by Scarlett Johansson transcends her human existence, not unlike the movie AlteredStates or Dr. Manhattan in Watchmen. Besson did something interesting with his use of transportation (locomotion) and the concept of motion. Movement is something that requires Time to exist, and creatures that move are creatures of Time. When she first began to evolve, she seated herself in a chair, motionless. Later, as she continued to evolve, Besson depicted Lucy walking around, then being driven, then riding in a plane, then driving (even though she had never driven before), but as she reached her highest state of evolution, attained her highest state of Knowledge, she remained seated in a chair again. She remained stationary, but Time and Space moved past her. But her physical body, as depicted in the film, was addicted to a blue, crystalline drug, perhaps symbolic of Knowledge itself. If something has the power to hurt us, is hurting us, and we are not strong enough to directly resist it, that doesn't mean that we cannot stop it. We have something called Choice. A tiny transistor, for example, can choose between off or on, 0 and 1, switching far more current than it uses to operate. In other words, we can redirect energies of things greater than ourselves to counteract the very source of the energy. Engineers use these kinds of redirections↗ frequently. Aikido martial artists do the same. The scale of the forces around us is not important, but only our connection to them, our interactions with them. If we have an interaction with them, then we have power, and choice is the greatest instrument of power in the Universe. If the Universe is fractal, then everything is connected, and our world is simply shaped by our own choices. So if we feed the substance that causes our addiction (knowledge) into itself, redirecting knowledge to create a paradox, we can break the machine by using Reason instead of logic, and can arrive at the conclusion that we are inside some of kind of illusory world. We've all already broken the machine once, it is called self-awareness, being aware of our own existence. Logic cannot tell you that you exist, for it requires a starting premise that cannot be obtained through logical means, the "I think, therefore I am" or "Cognito ergo sum" problem of Descartes. Before I continue, I should explain that analogies are one of my favorite ways of deriving knowledge from things, allowing me overlay them onto an observation to find where things match (congruences). They are important models, as they are already formed by patterns in nature or patterns in thought, and sometimes following the pattern will show you something that was not obvious before you overlaid it. I also rely heavily on inversion, flipping an idea along an imaginary line of symmetry, a reflection, and then see if the same patterns that applied to the original apply in reverse to its opposite. Because the Universe appears to be a duality, this is a very powerful tool. I view the Universe geometrically and believe that everything, even ideas and abstract concepts, has a shape. When we cannot see the shape, it is either that we do not have a language with which to recognize it or we are at a perspective that hides the shapes that we can recognize, analogous to a child walking inside a large geodesic structure at a playground. The shapes they see undergo geometric transformations and are difficult to recognize unless the child has developed an internal language of these transformations. Many of us in the 21st century choose to ignore the logical paradox of our existence, living in a state of "invalidity denial", escaping into a den of Internet-fueled knowledge stupor. The rise of the Internet in the 20th century created numerous new psychological addiction disorders. The analogies are interesting--you can substitute the history of substance abuse over the last 200 years with today's information technologies and find identical parallels. Remember the late 1990's Internet cafes? Opium dens. Remember all of the older films and TV shows depicting people smoking? Take away the cigarette and put a smartphone in their hand. Remember bar fights? Flame wars on online forums. Many people use Logic as a tool to discover new knowledge, and this is how it is used 99.9% of the time. But... there are paradoxes where logic does not work, where it simply breaks. To me, the knowledge produced by logical transformations of information is an infinite pattern, self-similar, just like everything in the fractal universe. To me, the true value of Logic as a tool is to use it as a "detector", to study how and why it breaks. Its uselessness is its useful function; a paradox in itself. I told you I like inversions. When I was young, I read older electricity books, and the AM radio tuners were called detectors, but when I got older they were called "discriminators", particularly when they were used for FM tuners. I remember trying to build my own crystal radio and tried to find cat's whiskers at my local Radio Shack store, but nobody knew what I was talking about. These components contained a hunk of rock known as Galena. I was very familiar with Galena, as it is my state mineral↗, and I found some at a school camp near an old lead mine in Potosi, Missouri. I later learned that cat's whiskers had been replaced by more modern components called "germanium diodes". Similarly, I asked the salesperson for "condensers", but again, he had never heard of them. I discovered later that "capacitor" was the new name for condenser. My grandfather, who used to drive me to the store, studied radio in the Army during WWII and was also stumped and did not know why a radio store did not carry those components. He did not realize that the terms had changed either. My point is that the words that denote the concept of "detection" itself, and that denote electronic detection components, change in usage over time, making the core concept "hard to detect", coming full circle. Words, themselves, are "components" of our internal detection circuitry, just like radio detection components are for radio waves. When words break, they give us insight into the underlying design, just like when radio components break. When words break, like a laser tripwire, they trigger my attention and narrow my focus onto the problem area. For example, many people forget that the first real-time electronic communication technologies were text-based and did not carry voice audio. Electronic text communication is far older than radio communication, and has been with us for almost 200 years. In the 1800's, people sent short messages called telegrams, later they also sent tickers (on ticker tape). By the mid-1900's, teletype was popular. People sent each other faxes starting in the 1960's. In the 1970's and 1980's they used computers (Unix, BBS) to send e-mails and carry out online chats. By the 1990's they had instant messaging, in the 2000's people texted each other using their phones (SMS), and today many people use social networks and send things like private messages and tweets. The same function, "short text communication by electronic means", has changed names multiple times. There are slight differences in technology, slight differences in operation and scope, but the universal function is the same. Unfortunately, when people use their newly created words instead of the historical ones, it makes it more difficult to notice that a distinct pattern has emerged. These distinct patterns of information coalesce and pass through our society, pass through Time. They become information entities. And these entities are the building blocks of knowledge. Knowledge cannot be stored properly until these entities are identified. This function is not a new technology as many people would want you to believe. There are few uniquely "new" technologies, since a truly new technology requires the discovery of new scientific laws. Technology is the application of scientific laws. Since the laws change little over the decades, what we see as technological progress is simply a different technology using the same fundamental laws. In recent years, for example, information technology corporations claim to have invented new technologies (social networks, for example), but what this really means is that they have created "new applications" of the same scientific laws. In many cases they have created an illusion of new forms of communication, but no new forms of communication have existed for thousands of years, only the medium and mechanism has changed. Even before electronic text messaging, there were semaphores and smoke signals. Some of these new communication technologies are not designed to send formal communications like letters or telegrams, but to send psychologically manipulative ones. These are not new technologies, but new applications of moral transgressions. Many people in the parapsychology field use the radio receiver as an analogy of the mind to convey how a person might be able to receive information that does not appear to be inside their brain. This is an interesting and old analogy, which I sometimes use myself. There are other analogies that I use as well, optics and the focusing of light, object-oriented abstraction (the focusing of information), and fractal patterns created via recursion. If you look at how people described the same phenomena over the centuries, it is fascinating, artistic, creative. These are wonderful works and no less right or wrong than other attempts. The same difficulties in obtaining Universal Knowledge have occurred for thousands of years in Mankind's research into non-physical worlds. Every culture and era has had its own way of describing the same phenomena, just like those Words that change usage over Time. You see, the problem with any observation that describes reality is that all observations describe reality, they are all part of the same reality. Imagine if you lived in different areas of a pear tree. People on an outer limb might say the leaf describes a pear tree, people at the base might say the trunk describes a pear tree, people inside a pear might say the seed describes a pear tree, people flying above it might say a roundish cluster describes a pear tree. All are correct--they all describe a pear tree. At what scale do you feel provides you with a sufficient description of a pear tree? At what point of focus? Describing reality and understanding it are two different things. In my opinion, we will never obtain a complete understanding of the Universe in life. Our current position (that of a finite, individual being) prohibits it. Sitting in the armchair is just as good as any other place (even better if you have pizza next to you). My favorite way to describe our reality from the Armchair is to use ideas that are well-suited to work done in computing and complexity science. It provides me personally with more meaning; I get the feeling that I understand more. There is no objective truth here, just my subjective feeling. One way I measure success is the degree to which the entirety of my being agrees with something, which comes in the form of feelings, primarily from my subconscious, formed from a collective of cells and thoughts. If a particular method of practice does not produce a result that feels right, I note the result as being weak, tenuous, and continue searching. Science, as a collective, uses a similar "feeling" called Occam's Razor, which gives preferential treatment to the simplest explanation out of competing explanations. It feels right to Science. Like a person with a gambling addiction, focusing only on the wins and not the losses, people look at logic's successes but not its failures. We need to break the addiction, and obtain an awareness of a hidden world that we cannot see with our senses, but only with our mind. To me, the questions are: Why are we trapped? What are we trapped inside? Who are we really? I propose that the computer is a self-similar model of our entire reality, being formed within the same reality. The Turing Machine, the mathematical model of the computer created by Alan Turing in 1936, is its elemental form. Within this model, there are 2 important components, the read/write head which usually remains stationary, and a 1-dimensional tape of discrete cells which moves back-and-forth. However, it can also be represented as a tape that remains stationary and the head moves back-and-forth. In this way, we can visualize the Universe, a giant spatial database, as the tape, and the observers, ourselves, as the read/write head. In other words, what we consider to be our existence is a combination of the two. Tuning requires 2 dimensions, one for the antenna, and one for the feed point (which is the where the tuning circuitry is attached), which can also be thought of as the direction of radiation, perpendicular to the antenna. This is analogous to the 2 dimensions needed for the Turing Tape and the read/write head. Because one is analog and one is digital, one is a Tuner and one is a Computer, we don't normally equate the two. Most of us would not call computation a form of tuning or signal selection, but in my opinion, they are the same. Analog computers are not Turing Machines, for example, but they are computers, and they can be built out of large numbers of operational amplifiers, for example. At the time of this writing, analog computers make up only a tiny fraction of today's computers, and they are complicated. The brain is an analog computer, and some scientists have modeled the functions of the brain using physical neural networks, some containing memristors, fascinating electrical components which were only recently invented. Engineers don't really know how best to use them yet, and they may be as important to computing advancements as the transistor was in the 20th century. When I was in high school in 1988, I wrote a research paper on neural networks for one of my classes, as I believed that they were the key to understanding human thought. I wrote more papers on the subject in later years. Few people had ever heard of them, but I was monitoring their developments in the scientific literature, specifically the systems being designed by John J. Hopfield, a Caltech scientist who combined knowledge of physics and biology, cross-disciplinary thinking that I thought was the key. Interestingly, the television series Star Trek: The Next Generation had just begun, and the writers chose to give their fictional android, "Data", a neural network brain, which I didn't find out until after I had written my paper. Hopfield's design is known today as simply the Hopfield network, and since then there have been numerous other designs. And when I encountered Jeff Hawkins' Memory-Prediction Framework model in the 21st century, I knew that he had found the basic model of thought. Just like the words that changed in radio and text communication, today people use the term "deep learning" to encompass a variety of such technologies that preceded them. But like I said earlier, it is important to remain focused on the Universal concept, not today's buzzword for the technology. In my opinion, the core of what most of us consider human thought, our learning, our memories, our abilities to understand natural patterns and stimuli is due to an analog interconnectedness and strengthening of patterns over time, complexity that emerges from simple rules, patterns that abstract themselves; fractal patterns. Some simply call this Nature. Thought is thus a path or journey through Nature. Our brain is a memory pattern, formed by nature. We just happen to be inside this memory pattern as it forms. If we sit still and focus our gaze onto natural phenomena, the same thing occurs, we see the evolution of a pattern in nature. Fire, for example, is a mesmerizing pattern to me. Watching fire calms my internal thoughts and holds my interest. I have moved my point of focus into the fire and away from my internal thoughts, in a way, becoming the fire. In other words, what most of us think is cognition is simply observation, observation of our own memory structure, which we perceive as our thoughts. One of the most profound things about the armchair is that fact that it remains stationary, and the occupant must also remain stationary with respect to the chair. By keeping yourself still, and allowing your thoughts to move, you can more easily perceive an important separation, a duality, that thought requires both Energy and Space, the observer and something to observe, something to write on and write with, the processor and the memory. The age of the chair as a human invention, is unknown, of extreme antiquity. It is so old that there are no known historical records. While the chair has seen more use in Western cultures, it is arguably among the first human tools (depending on how one would define tool, chair, and human) as the first thing we do when we are too tired to stand is to sit, and basic physics tells us that it requires more energy to lower and raise our body from standing position to the ground than from standing position to an intermediate height. Our upright anatomy bends in just the right place, and a chair allows us to look around and resume a standing position quickly if needed. When tables were invented, chairs would have been useful as a way to elevate a person to keep their arms at the working surface while sitting. There is another thing that is interesting about chairs. They are limited to a specific physical use, platforms that support our weight under gravity. In the International Space Station (ISS), for example, they have no chairs around their kitchen table, but float around the table to prepare their meals and eat. They "sit" in mid-air using only using straps for their feet. In non-physical worlds, like MMORPG games, they have little value, and in many games the chairs are just decorative; your avatar cannot actually sit in them. Richard Garriott, however, the 6th private space tourist to board the ISS, creator of the first MMORPG game (even coining the term MMORPG itself), has a peculiar fascination with having working chairs in his video games. It is easy to see why, as the chair is something that ties us to the physical world. Garriott's famous avatar, Lord British, frequently sat upon a virtual throne. Santa Claus, The Watchowski's Morpheus, and Captain Kirk all performed important acts while seated in their armchairs. It is their connection to our physical world. Rodin's famous "The Thinker" sculpture is sitting on a pedestal. One of my favorite analogies, one of the ways that I visualize reality while sitting in an armchair, is to think of the Universe as a giant database, memory store. I like to view it as a vast, flat floor in the center of a giant, empty warehouse. And on the floor are rows and rows of sheets of paper containing information, all spread out on the floor. We, the observer, are like a little kid in sneakers sitting in a chair somewhere in this vast field of papers. Some of the papers closest to us have yellow birds sitting on them. Those are our special papers, our brain's memory. When you first decided to sit in that chair, you placed your only two belongings, a coin and a pencil, underneath your chair for safe keeping where you could not accidentally step on them, but a black crow suddenly hopped under the chair, picked them up and flew out of sight. Our entire existence is spent asking questions, and then running across this field of papers, picking up certain ones in sequence, and then running back to the chair to read them to find the answer. Immediately after we read them, a yellow bird comes to pick up the papers and fly them back to their places. If there wasn't a yellow bird there before, there is now one sitting on that paper. The yellow bird population grows to great numbers as you learn. This is how a document-oriented database works to generate Knowledge. You ask a question (a query or search), and the CPU retrieves the documents that match your query (keyword or metadata search), creating a new document for you to read, perhaps prompting you to create new documents. But what is on those documents, those papers? The only thing on those papers is a list of what other papers to look for (their relations). So the CPU goes on a giant treasure hunt, finding papers that tell it to find other papers, until the papers finally end in either a 0 or 1, the coin or the pencil, your only true possessions. You are trying to find the possessions that were hidden from you the moment you sat down in that chair. However, if the "floor" of that warehouse was 4th-dimensional spacetime, there is no need to return back to your chair to read the papers, you simply follow the papers with the yellow birds, running and running. When your feet land on the paper, the yellow bird opens its wings. You can zigzag as you please, but you must follow the yellow bird road. The World Wide Web, a giant mesh network of documents with search engines is eerily similar, but the generation of new knowledge is in its early stages, known as Web 3.0, the Semantic Web. It is the foundation of a giant brain, for better or for worse. Somewhere, in an emerald city far away, there is a wizard with a crow on his shoulder, a coin in his pocket, and a pencil in his hand. If we take this to its lowest level of abstraction, its highest order, the floor is like a giant 2-dimensional Turing Tape. You, the kid in sneakers, are like the read/write head in the Turing Machine, but instead of remaining stationary while the tape moves, the tape (the papers), remain stationary and you move. The yellow bird road is our path through the Universe, our past and future "light cones", but the birds with open wings show us our own worldline. This child, that seems to be ourselves, has no memory, it seems to be a being of energy. All memory is in the space that it traverses. No matter how long the road to the wizard, the child never ages, but the road does. The road begins to deteriorate the farther out one goes. Eventually it becomes impassible and and we reach a deadly desert↗. I don't know where the story goes from there; the analogy has broken down. What I'm trying to convey is that computation doesn't always look like what we think, the stereotypical "black box" where we provide an input and it returns an output. Like those kids in the geodesic playground, when we are "inside" the computation, it looks different to us. Tuning a radio, for example, is discriminating a signal from the noise. Performing a database query (a search) is also discriminating a signal from the noise. Discrete knowledge in the form of our alphabet, letters, words, and language is geometric, just like the sine wave of electromagnetic energy, which is intimately related to the circle and right triangle, is geometric. Computation, at its most basic form, is "choosing", like the transistor logic of modern computers. When we metaphorically read the papers on the yellow bird road, we have no memory of our past or our future, only the paper in our hand. Memories lie only in the road; it is paved with memories. This is analogous to tuning in a radio signal. RF signals of other frequencies are all around us, like hidden spider webs fixed at 186,000 miles per second, but we only hear the signal to which we are tuned. Similarly, with visible light, we only see the object in focus, not the blurry image outside of an object's depth of field. All of these things are the same, core concept. Society keeps branching and becoming so specialized that people forget to move backwards, to generalize, to find those metaphysical Universals. There are other states of mind that are no different than our waking state, they are simply papers scattered about on different roads, in different lands. The same tuning, choosing, focusing mechanisms are present. I find it interesting that, at the time of this writing in 2015, nobody seems to be studying the electrical patterns within the microcomputer hardware that occur when software algorithms are executed. I have never heard of any scientific studies that look for patterns formed in transistor activity related to software design patterns. This would be analogous to studying which electrical appliances people use at what times of day within a large city, and comparing those patterns with news events or mass media. Social science does not usually direct itself to studying machines in this way, but only if they alter human society in some way. It is these kinds of cross-disciplinary studies that will find the answers. Turn your head in that armchair and look around you. Everything you see is a type of memory, information that has a spatial arrangement. The Universe is indeed a giant spatial database. If you close your eyes and think, you are still looking around, but this time you are using your inner eye, and your surroundings are your brain's memory. Many people that experience OBE (out-of-body) and NDE (near-death-experiences) have reported that there is a database of all knowledge in the Universe (Akashic records↗, the Collective Unconscious↗, the remote-viewing Matrix↗, etc) that can be accessed if one is in the right state of mind. I do not doubt there is such a database, since, as I mentioned earlier, it is the Universe itself. But these people report that all knowledge is available to them--they just have to ask. People that experience NDE's say they can see everything at once, know everything. To me, this doesn't seem to be a repository of data (database), but a person's ability to access it. Perhaps, instead of being a "kid in sneakers" running and grabbing papers, they somehow access the papers instantaneously, Like the neural net I mentioned earlier, they are acting as collective observers. In my opinion, when the Universe went from the singularity at the start of the Big Bang, to its present form, it changed from 1 to 2, it moved from a singular form to a collective form, like the bifurcations found in chaotic geometry. They can produce self-similar patterns, and certain types always approach a ratio of approximately 4.669, known as Feigenbaum's constant, and I sometimes wonder whether it is the fractal dimension↗ of our Universe. Barriers to our understanding lie on those phase transitions, lines of transformation, those deadly deserts of shifting sands, but like how the missing frequencies in a star's spectrograph can tell us that hidden matter is present, the missing solutions caused by our logical paradoxes tell us that hidden knowledge is present. These seem to be distinct states, qualitatively different from each other. All of us have experienced many of these states, some people have experienced all. There are perhaps more states that I am not aware of, and there are states that I did not list. Now, what does science tell us about these states? Almost nothing. It refuses to look. The armchair is a spaceship, but it does not traverse Spacetime, it transcends it. Analogous to optics, a telescope lets us see farther, a microscope lets us see nearer, but our mind can detect things that are too far or too small to be detected by instrumentation. Neptune, for example, was detected by gravitational perturbations of Uranus (our mathematics). We saw it only indirectly, in our mind. But the same mind that science uses as an instrument for detecting physical phenomena is considered invalid for detecting non-physical phenomena. Because modern science does not have scientific evidence to support the existence of non-physical worlds, it does not consider data from non-physical worlds. This is a Catch 22, paradoxical reasoning. For example, all of us sleep for approximately 1/3 of our lives and experience a dream world. There is scientific evidence to support this. All of us are awake for approximately 2/3 of our lives and experience a waking world. In most of our dreams, we believe the dream world to be real. In most of our waking state, we believe the waking world to be real. These are 2 different, time-sharing states of existence and yet our waking state science only considers 1 of these states to be real, the waking world. For many years, I used to believe the same thing, that the waking world was real and the dream world was an illusion, but there was no logical reason for this belief. I had based my belief on a feeling of "realness", but like "Cognito ergo sum", there is a missing premise. There is no universal fact, no logical truth that can ascertain the reality of any of our states of existence. They are all equally likely to either all be real or all be illusions. What I confused earlier as feeling more real is simply the phenomena of feeling more physical, feeling the forces and mass of the physical body, feeling the gravity, tiredness, energy limitations, the more detailed vision. There is a clarity of thought in the physical world that is different than the dream world. At first I believed that this clarity was inherent to my being, that my waking self was more cohesive than my dream self. But closing my eyes and removing outside stimuli (sensory deprivation) curiously makes it harder to retain this clarity. So clarity of thought in the waking world seems to be reinforced by physical stimuli. It's as if the physical world is providing us with a baseline pattern, a stable signal. When we lock onto that pattern, a type of cognitive noise suppression occurs, but when we lose the signal, the noise levels return, analogous to AGC (automatic gain control) on a radio receiver. The noise is the chatter of our own inner voice, our thoughts. And if you are sick or impaired in the waking world, the dream world will not have that impairment and seems to be unaffected. Since scientific instruments are physical machines, and physical machines cannot be inserted into non-physical worlds, why can't people themselves be the instrument for gathering empirical evidence? Why can't a person's memory, their recollection of events, be valid data? We can account and compensate for human inaccuracies in data gathering. We've done this sort of thing for thousands of years. And human consciousness can enter places that do not allow physical machines. If we are conscious, we can bring many of our "mental" machines with us. Prior to the digital computer, people performed complex tasks using mental discipline, education, organization and communication. World War II is a recent example, but there were many ancient civilizations that did this as well. Today, many of our empirical instruments are computer-based, but it is possible to move these mechanisms back into our minds. Earlier I mentioned that tuning (signal detection) and database queries (knowledge detection) were the same thing, but humans, themselves, can do the same thing. Have you ever watched a police "detective" at work? I have, and it was a fascinating experience. Trained detectives are rigorous and methodical, collecting, manipulating, and observing, not unlike the Scientific Method, but they are doing this on their feet, in real-time. After witnessing one first-hand solve a case for me, I have a greater appreciation of their profession. I've since watched a lot of Columbo and Death Note, both wonderful detective television shows. I am among the worst detective one may find--it is a skill that is difficult for me. When I was young and read detective stories or mysteries, I could hardly stay interested--the plots seemed haphazard, I could not follow the author's leads. And when I got to the end, where everything was explained, it just made me that much more aware of my poor clue-finding ability. I look at things that many people consider mundane, structure instead of detail, but I make great connections to pattern. I can diagnose a fault with a machine with ease, but when an "intelligent entity" is involved, the expression of its intelligence does not stand out to me among the physical, unless I am made aware it is there. A detective, though, can model another entity in their mind and quickly determine the implications and pull this entity out of the background noise. For me, it simply would take too much time, there are too many possibilities. I don't know which ones are valid. I learned long ago that I had a blind spot there--so to correct my weakness, block that vulnerability, I created logical rules, like a web, and I can then notice if something disturbs that web. I may not notice something right away, but when my web feels it, it also supplies me with a trail I can follow to the source. A detective works like an ant, very aware, looking, moving, finding things that are out of place, but I have to work like a spider. Sometimes it confuses people when they see me tying up loose ends, closing the logical loops, believing it to be redundant behavior, not understanding it is part of a larger plan. There are many analogies to this: double-checking your blind spot before changing lanes while driving, using checklists even though you are very familiar with a procedure, etc. Given enough Time, a logical loop will catch a critical error, saving you or others from danger. Many professions use such routines↗ to prevent error which might appear redundant to outsiders. The mental disciplines that I see in certain professions, and the mental tools that I've created for myself, prove to me that we, as People, are an untapped resource for empirical science. We can create checklists and logical loops to add rigor to our thought processes. The instruments can be created in our minds. It is a great shame that thousands of reports of shared human experiences are being ignored. In one aspect, empirical science considers the human body to be a purely physical machine, devoid of any supernatural abilities. And yet, as physical machines, it doesn't consider them "good enough" to become the very instruments for scientific measurement. The mainstream scientific community must integrate human beings as scientific evidence gathering instruments within the Scientific Method or else scientific knowledge will never progress into non-physical realms. We are extraordinary instruments, tuned by Nature. Human collectives are used by empirical science to help perform analysis of "collected data" (Galaxy Zoo↗, etc), but not in the actual "collection of the data", the evidence, the interface between the phenomena and the collected data. I've searched for scientific data on non-physical worlds, armchair worlds, and found almost nothing. But if you look at esoteric literature, the information is vast. However, most of it does not use the same rigor that trained scientists use. The introspection provided by the armchair is an exciting playground for our thoughts, but it also exposes our own darkness. For many of us, myself included, the physical constraints of the Universe are there for our own self-protection. Our thoughts do not manifest into the physical world; we have to go through a fairly laborious process of reasoning and skill to transform the materials in the world into the forms we idealize. If our thoughts were to manifest instantaneously, many of us would soon find ourselves in a hellish world driven by our own fear. When we use speech to communicate with each other, our thoughts do not utter from our mouths; we filter them through various layers before speaking. If our thoughts were instantaneously uttered, we would have the same difficulties that some people with Tourette Syndrom encounter, controlling emotional, spontaneous, and intrusive thoughts. Again, the physical world is there to save us from ourselves, impede us, slow us down. Because of these physical restrictions, most of us do not learn how to control our own thoughts; there is no need. We just need to control our external actions. Western education rarely concerns itself with the internal thoughts of the student, instead prioritizing the knowledge, values, ethics, and demonstrated skills. Most of us view our own thoughts as a private matter, perhaps the most private matter of our lives. Most of us view things like state-run thought control as a totalitarian nightmare. One of the hallmarks of the lucid dreaming and OBE states is just that--your thoughts do become reality instantaneously, and you have conscious control over them. The physical barriers and delays are no longer present. For some, this is a wonderful world, for others it is hellish. It depends on your own fears and insecurities. If you are fearful and angry, you will manifest monsters. If you are calm and loving, the world is a beautiful place. In the past, when I have had lucid dreams, I was so hyperactive within the dream that I couldn't stay in it long. I have since read that calming yourself is critical. A couple of weeks before starting this essay, I had a lucid dream, a dream where I had conscious realization that I was dreaming, and I immediately took off and began flying. I then started acting like a child, doing childish things (even imagining in 3rd person that I had attained a child avatar form), taunting other people in my dream. I felt like the most powerful being in the universe. I looked at my hands and they were translucent, and I soon dropped out of the dream and woke up. As soon as I woke up, I thought, "I finally have another lucid dream and I start acting like a childish imbecile!" If those people in my dream were real beings and not just my imagination, then I apologize and am ashamed to have acted in that way. I then started questioning why, after reading about it and telling myself that I need to remain calm, that I still acted that way. I felt as conscious and as in-control in that dream as I do in waking life (except the world, of course, had fuzzy, dream-like qualities). I didn't have all of my conscious memories with me, all of my adult mind, my thought-filtering techniques (or else I had forgotten about them). I was overwhelmed with conscious power and freedom. And this childish behavior was simply the same chitter-chatter of my thoughts manifesting instantaneously. As an adult, I don't act on childish thoughts from my mind; they are background chitter-chatter, and they provide me with great creativity when needed, but in the non-physical world, the Child is in control and the Adult mind is nowhere to be found. I haven't tried to have any lucid dreams since then. It is hard for me to admit this, but I feel that I am too immature to navigate them until I gain better control over my own thoughts in the waking world. I empathize with people that have the extreme forms of Tourettes. But the experience have given me another new insight into the physical world. If these non-physical worlds are other worlds, just as real as the physical world, then the physical world makes an excellent training ground for us. It also made me confront the reality that my inner self is still a child, and the layers of adult knowledge and rules that I've learned over the decades remain remnants of a physical world. No matter how powerful I think my adult mind has become, it is simply a self-delusion. All of us, no matter what age we have attained, no matter how wise we think we have become, are just children with fancy tools.